Orthodontics is the branch of dentistry that specializes in the diagnosis, prevention and treatment of dental and facial irregularities. The technical term for these problems is “malocclusion”, which means “bad bite”. The practice of orthodontics requires the professional skill in the design, application and control of corrective appliances (braces) to bring teeth, lips and jaws into proper alignment and achieve facial balance. An orthodontist has 2-3 years of specialized university training beyond dental school and is a specialist at straightening teeth and guiding facial development. A dentist may see only a handful of “malocclusion” cases a year, not nearly enough to develop the knowledge and skill required to properly treat a variety of orthodontic problems. An orthodontist only practices orthodontics and treats hundreds of patients. Do I need a referral from the dentist to make an appointment with Dr. Korne ? No. While some of our patients are referred to us by their family dentist, many others are referred by friends and from visiting our website. The American Association of Orthodontists recommends that all children visit an orthodontist by age 7. Fortunately, many young patients don’t need anything more than observation while their permanent teeth are growing into place; however, some young patients may have problems that require immediate intervention. Absolutely not! No patient is ever “too old” to wear braces. In fact, one in five orthodontic patients is an adult. 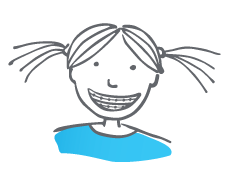 If you or your child can benefit from orthodontic treatment, simply call our office, send us an e-mail (information@www.korneortho.com) or stop by our office. We will be happy to schedule an appointment for you. Is there a fee for the initial exam? Our initial consultation for children under 18 years of age is 85$. For adults, the initial consultation is 125$. Upon arriving, the patient and parent will be greeted by the staff and doctor. After a tour of the office facilities, we will take the necessary photographs and x-rays to allow us to make a proper diagnosis. The doctor will then complete a thorough evaluation. Is there an orthodontic problem? When is the best time for treatment to start? How much will treatment cost and what financial arrangements are available? Removing teeth is sometimes required to achieve the best orthodontic result. Straight teeth, a balanced facial profile and stability of the bite are the goal of orthodontics. Treatment time depends on each patient’s specific orthodontic problem. In general, treatment times range from 12 to 30 months. The average time a person is in braces is about 22 months. How much will braces cost and are financing options available? It is impossible to give an exact cost for treatment until we have examined you. The cost of braces and the financial options will be discussed during the initial examination. We have many financing options available to accommodate your needs and will be happy to review these with you. Appointments are scheduled according to each patient’s needs. Most patients in braces are seen every 6 to 8 weeks. If there are specific situations that require more frequent monitoring, we will schedule appointments accordingly. Numerous appointment blocks are set aside in the schedule every day in case a patient requires immediate attention. Please phone the office to reserve one of these times. Yes. We will provide you with a custom-made sports guard to wear for all contact sports during your treatment in braces. Yes! Regular checkups with your dentist are important while in braces. Your family dentist will determine the intervals between cleaning appointments while you are in braces. Yes. Once treatment begins, we will give you thorough instructions on how to care for your teeth and provide you with a comprehensive list of foods to avoid. Some of these foods include: ice, hard candy, raw vegetables and all sticky foods (for example, caramel and taffy). You can avoid most emergency appointments to repair broken or damaged braces by carefully following our instructions. Yes. A tooth with a crown will respond to orthodontic forces just as one without. When teeth are missing, orthodontic treatment will aid in the alignment of the remaining teeth. Yes. Some orthodontic problems are significant enough to require early intervention to prevent them from becoming more severe and to improve self-esteem and self-image. If a patient is not yet ready for treatment, we will follow that patient’s growth and development until the time is right for treatment to begin. The retention period of treatment normally lasts approximately 12 months. During this period, appointments are scheduled with decreasing frequency. Retainers can either be a removable acrylic device or a small wire bonded to the inside surfaces of the front teeth. If the retainer is removable, it is usually worn at all times during the first three to six months after the braces are removed, except when eating, brushing, flossing or during active sports. Bonded retainers are to be worn for an indefinite period of time. In general, after 3-6 months of retainer wear, removable retainers are generally worn every night, or perhaps less, as instructed. Each person’s requirements are different, and a longer period or a different schedule may be recommended if facial growth is not complete. In the majority of cases, indefinite wear on a part-time basis is recommended to maintain the desired changes that have been achieved. Orthodontists are aware that there may be minor changes in tooth position. The position and fit of teeth generally change throughout your life, with or without orthodontic treatment. Our goal in the retention phase of your treatment is to limit these changes to the natural process of accommodation while maintaining both a good functional and aesthetic result. Will my retainers need any maintenance? Retainers should be worn in the mouth or placed in its protective case to avoid loss or breakage. To keep clean and fresh, brush the retainer with cool water and toothpaste and soak it periodically in mouthwash. Never place your retainer in hot water, as it may become distorted and require replacement. Do not soak your retainer in a denture-cleaning solution because the metal joints will erode. If a toothbrush is not available after eating, rinse off your retainer and place it back in your mouth or in its case. Beware of putting your retainer in your pocket where it could break or distort. Also, avoid leaving it out where pets or small children could find it, or where it might become lost. Phone the office right away for an appointment to replace or repair your retainer. There will be an additional charge to repair or replace your removable retainer. This is still a relatively inexpensive way to protect the investment you have made in your orthodontic care.